Kids Martial Arts training at our school in Melbourne is conducted using the most innovative training methods and just the right amount of fun, our program teaches our young students the life skills and physical skills to help them reach their full potential. We teach children to be confident, focused, respectful, and courageous and to use their Martial Arts skills only as the last step of action in self protection. Our Kids Martial Arts teaching methods and programs have been very successful with children retaining what they have learnt after each class through encouragement and positive reinforcement. Over time this greatly improves your childs confidence and self esteem. So that because of our philosophy of positive reinforcement, their interaction with instructors and other children, your child will develop the security and confidence to thrive in all situations. Our Kids Martial Arts Training in Melbourne is not just about physical repetition , over time they will be more focused, attentive, and equipped to do their very best in school and in all aspects of their lives. 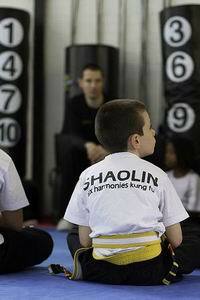 And finally, family values like manners, humility, self-control, and honesty are an integral part of Martial Arts training. Our school is one of the few places outside the home where these principles are still taught. 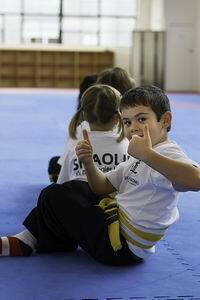 They are perhaps the fundamental difference between our Kids Martial Arts in Melbourne and any other activity that your child may participate in. We like everyone that comes along to Six Hamonies to recieve a free 3 lesson trial so you can see for yourself just how good our programme is. To book in for your free trial please call 9537 0620 or even easier fill in the enquiry form below and we will contact you as soon as we are able.